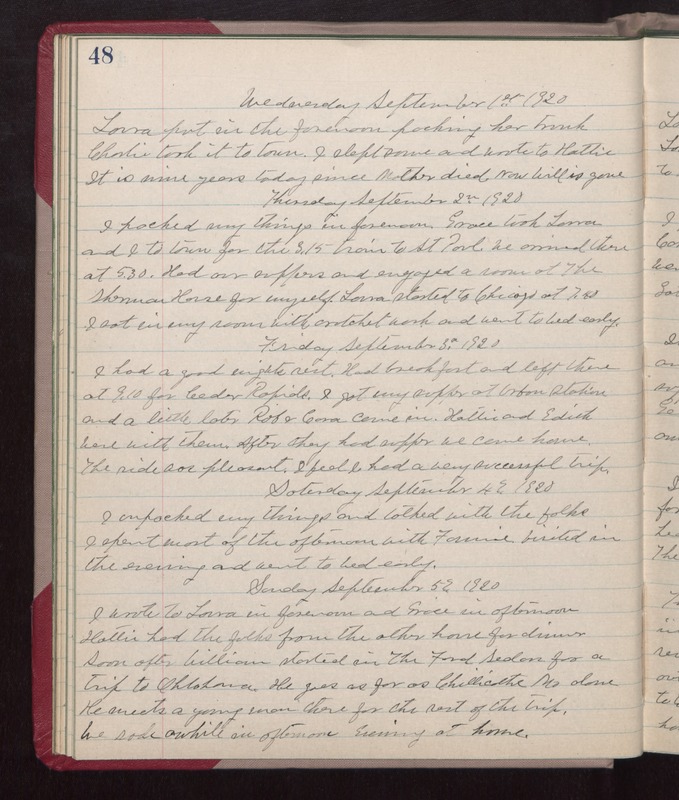 Wednesday September 1st 1920 Laura put in the forenoon packing her trunk. Charlie took it to town. I slept some and wrote to Hattie. It is nine years today since Mother died. Now Will is gone. Thursday September 2nd 1920 I packed my things in forenoon. Grace took Laura and I to town for the 3.15 train to St Paul. We arrived there at 5.30. Had out suppers and enjoyed a room at The Sherman House for myself. Laura started to Chicago at 7.40. I sat in my room with crotchet work and went to bed early. Friday September 2nd 1920 I had a good nights rest. Had breakfast and left there at 9.10 for Cedar Rapids. I got my supper at Urban Station and a little later Rob & Cora came in. Hattie and Edith were with them. After they had supper we came home. The ride was pleasant. I feel I had a very successful trip. Saturday September 4th 1920 I unpacked my things and talked with the folks. I spent most of the afternoon with Fannie. Visited in the evening and went to bed early. Sunday September 5th 1920 I wrote to Laura in forenoon and Grace in afternoon. Hattie had the folks from the other house for dinner. Soon after William started in The Ford Sedan for a trip to Oklahoma. He goes as far as Chillicothe Mo alone. He meets a young man there for the rest of the trip. We rode awhile in afternoon. Evening at home.